The global eco friendly bottles market has risen at a rapid pace in recent years in response to the growing support to environmental causes from governments and the masses alike. The eco friendly bottles market has been driven by the eagerness of key competitors to cash in on the growing support to environmentalism, which has led to consistent innovation, as well as steady government support. The steady prevalence of these drivers is likely to enable rapid growth of the eco friendly bottles market in the coming years. According to Transparency Market Research, the global eco friendly bottles market was valued at US$2.5 bn in 2017 and is likely to rise to US$3.7 bn by 2022, exhibiting a strong 8.1% CAGR therein. The global eco friendly bottles market employs a number of materials in order to produce high-quality eco friendly bottles. Currently, polylactic acid is the dominant material segment of the global eco friendly bottles market and is likely to dominate the market’s proceedings in the coming years due to its widespread usage. Polylactic acid accounted for 35.3% of the global eco friendly bottles market in 2017 with a valuation of US$902.3 mn. The segment is expected to rise to US$1,322.8 mn by 2022 at a strong CAGR of 8%. The mechanical properties of polylactic acid make it favorable for use in the production of bottles, which is likely to ensure steady growth of the segment in the global eco friendly bottles market in the coming years. The leading regional contributor to the global eco friendly bottles market is North America, which is likely to retain its dominance through the forecast period thanks to the widespread distribution of environment-friendly infrastructure in the developed region and the steady government support for expansion of the same. The eco friendly bottles market in North America was valued at US$617.2 mn in 2017 and is expected to rise to US$1,123.4 mn by 2022, exhibiting a solid 12.7% CAGR from 2017 to 2022. Europe is also an important contributor to the global eco friendly bottles market and is likely to remain a key region for technological development as well as sales expansion for the eco friendly bottles market. Like in North America, the eco friendly bottles market enjoys solid government support in Europe, where environmental conservation has been a valued tenet of most governments. The Europe market for eco friendly bottles accounted for more than 32% of the global market’s revenue in 2017. The Asia Pacific except Japan market for eco friendly bottles could emerge as a significant player in the coming years, with the market expected to create an absolute opportunity of US$252.2 mn over the 2017-2022 forecast period. The Japan market for eco friendly bottles is also set to rise to a strong valuation of US$228.2 mn by 2022, exhibiting a steady 6.2% CAGR upon its 2017 valuation. Leading players in the global eco friendly bottles market include EcoXpac A/S, One Green Bottle, Earthlust, Ecologic Brands Inc., SKS Bottle and Packaging Inc., Cascade Designs Inc., Pachamama, and Pepsi-Cola Metropolitan Bottling Company. The global eco friendly bottles market report delivers a comprehensive view of the market through detailed analysis of the market’s historical growth trajectory and the current drivers determining the market’s growth potential. The historical growth trajectory of the global eco friendly bottles market is described in the report with the help of 2012-2017 profiles describing the growth of each component of the market. The detailed analysis of the growth trajectory exhibited thus far by the global eco friendly bottles market provides a solid foundation for reliable predictions regarding the future growth prospects of the market. The comprehensive view of the eco friendly bottles market provided in the report takes in the market’s geographical segmentation, its leading product segments, the key competitors looking to dominate the eco friendly bottles market, and the key factors affecting the market’s growth in the long run. According to Transparency Market Research, the global eco friendly bottles market was valued at more than US$2.5 bn in 2017. Exhibiting a robust 8.1% CAGR, the market is expected to rise to a valuation of US$3.7 bn by 2022. The major drivers and restraints affecting the global eco friendly bottles market are assessed in the report. The market is subject to ever-changing market forces that call for a dynamic operating style, as the field of eco friendly bottles is still relatively untapped and consists of consistent research efforts, which can influence the industrial dynamics to a significant extent. Major drivers working for the global eco friendly bottles market include the rising support for environmentalism among the global masses, which has seen rising adoption of eco friendly options in a number of household appliances. On the other hand, price constraints and lack of awareness in developing countries has held back the global eco friendly bottles market. By material, the report segments the global eco friendly bottles market into polylactic acid, starch, water soluble polymers, cellulose, aliphatic/aromatic co-polyesters, molded fiber, polyhydroxyalkanoates, bio-derived polyethylene, and others. Of these, polylactic acid (PLA) is likely to dominate the global eco friendly bottles market in the coming years due to the convenience of its use in a variety of application sectors. Bio-derived polyethylene could also play an important role in the development of the eco friendly bottles market in the coming years. The polylactic acid market is expected to exhibit an 8% CAGR over the 2017-2022 forecast period to account for more than 35% of the global eco friendly bottles market. Geographically, North America is the major contributor to the global eco friendly bottles market and is likely to rise to a valuation of more than US$1.1 bn by 2022. The North America eco friendly bottles market was valued at US$617.2 mn in 2017. The eco friendly bottles market in Europe is likely to remain an important contributor to the global market in the coming years, with the region expected to account for more than 32% of the global eco friendly bottles market by the end of 2017. The report profiles the leading players operating in the global eco friendly bottles market in order to present readers with a clear picture of the competitive dynamics of the market. The various forces likely to affect the operating conditions in the eco friendly bottles industry are profiled in the report. 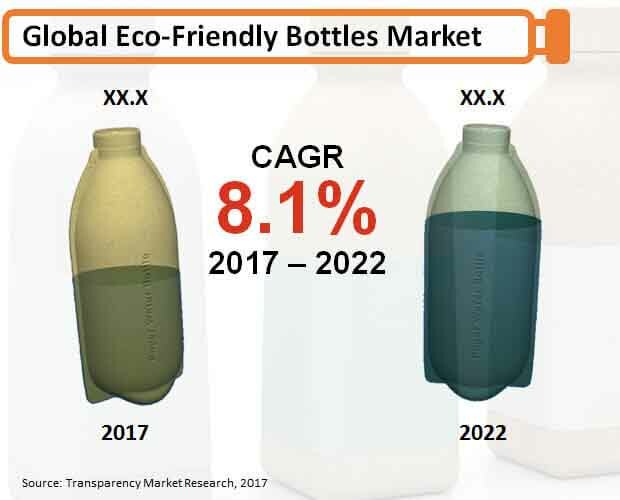 Key players in the global eco friendly bottles market include EcoXpac A/S, One Green Bottle, Earthlust, Ecologic Brands Inc., SKS Bottle and Packaging Inc., Cascade Designs Inc., Pachamama, and Pepsi-Cola Metropolitan Bottling Company.